The School Climate Committee (SCC) has worked very hard over the past 5 years to come up with a unifying theme for our hard-working and spirited school. The spirit of the school is embodied in our mascot, the dragon. 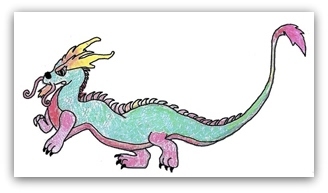 In 2010, the SCC held an art contest for all JQS students to find our dragon. Hundreds of children submitted their artwork, and the winning drawing is shown above. The winning student artist was Nicurtis Robinson-McCaskill. His design is used in the school's daily activities and can be seen throughout the school and JQS website. School Cheer - We Are The Dragons! One of the main themes of the PBIS is promoting safety & respect among all students. A giant replica of the JQS dragon lives on the wall of the cafeteria. These scales are then added to the dragon's back. When students exhibit the positive behavior outlined in the Bill of Rights, they earn a scale to place on our dragon mural. For example, any student observed displaying courteous, respectful behavior by staff other than their own teacher can be presented with a dragon scale. Every few months, JQS holds a Jamboree for the students to celebrate their hard work in earning scales.